SCVHistory.com | COC | Board Picks Contentious 'Santa Clarita' Name for District (1967), 'Canyons' for College (1969). The Newhall Signal and Saugus Enterprise | 1967 and 1969. For an explanation of "Valencia Valley" vs. "Santa Clarita," read this. Votes for Santa Clarita Valley Junior College District Name. The Newhall Signal and Saugus Enterprise | Friday, December 15, 1967. Valencia Valley's new junior college district was officially named the Santa Clarita Valley Junior College district Wednesday night. The board of trustees of the now one-week-old college district made this decision even though at several points in their discussion they admitted the long and lilting name was somewhat controversial. In fact one of the board members, Bruce Fortine, argued at some length that there were a number of other names that would probably serve just as well or better. The significance of the board's decision, of course, is the fact that this valley basin has no official name as yet. As close as anything comes to being official is the name which appears on some maps, describing the area as the Upper Santa Clara River Valley. This name, nearly everyone seems to agree, is a clumsy one. And over the last few years, a battle royal has waged between Santa Clarita and Valencia as the official names. The decision was not unanimous. Board president William G. Bonelli, who at the board's first meeting Monday night had asked that Roberts Rules of Order be modified so he could have the right to vote, did not say anything as the ayes and nays were heard. And later when one of the women in the audience who had been one of the very vocal Santa Clarita supporters asked for a roll call, presumably to find out how each board member had voted as a possible campaign issue at a later date, Bonelli refused. "Only a board member can ask for a roll-call vote," he said, and then with an icy stare told the lady that the "vote was not unanimous." The board members were, of course, quite aware that their decision on a name was bound to be controversial even though they spurned one of their own board's suggestions that they therefore choose a "neutral name." Part of their reluctance to choose a name of their own was apparently due to the fact that although the audience was sparse that night, it contained several adamant supporters for the Santa Clarita name. Champions of the "Santa Clarita" name, who entered the meeting hall and gathered in vaguely conspiratorial knots, were for the most part armed with "petitions" of all sizes, shapes and degrees of accuracy. Bill Kohlmeier, a local restaurateur, presented a list of 380 persons he said had signed petitions favoring the name that was finally adopted. One of the most impassioned pleas for the name "Santa Clarita" was made by Arthur Evans, onetime publisher of the now defunct weekly shopping publication, the Santa Clarita Sentinel, a sometime political lobbyist, and currently President of the Canyon Country Chamber of Commerce. More support for the name also came from two presidents of local Homeowner Associations. One of them, Don Abernethy, an unsuccessful candidate for the board at the recent elections, insisted he had taken a poll that afternoon to find out what sentiment in his tract was. He claimed his poll — which he conceded was probably not too "formal" — had been overwhelmingly in favor of the name he was plugging. Board member Sheila Dyer, who had been quite open about her support of the name from the very first meeting, Wednesday night also read from the minutes of a state geographic subcommittee meeting two years ago in which Evans and Jack Nelson, a director of the Santa Clarita Bank, to lobby [sic] for the ''Santa Clarita" name. That committee, incidentally, has recommended that at this date no official action be taken. The motion to go for the name finally adopted came from board member Peter Huntsinger, who started out by declaring, "There are ample choices besides Santa Clarita. However, I would like the board to make the decision based on what they feel would be a satisfactory name — and try to determine in our own minds what the majority of the people want." Fortine then said that perhaps the thing to do would be to choose a neutral name. He pointed out that one of the reasons the board had postponed decision until Wednesday night was for persons to step forward with suggested names. The board discussed two or three of the many names that had been suggested, and then decided to abandon the list in favor of Santa Clarita. Just as the board appeared to have no time to discuss the various alternative names, neither did most of the "Santa Clarita" fans have time to stay for the rest of the meeting to hear about such educationally related subjects as a $45,000 budget, or the progress on acquisition of a campus site. Except for two representatives of the homeowners group, practically all of the name buffs left. The two homeowner men stuck around until the end, and following adjournment they strode outside into the cold. Said one to the other: "Let's go get a quick snort." The Junior College Is Finally Named. The Newhall Signal and Saugus Enterprise | Monday, May 19, 1969. Valencia Valley's junior college district trustees named their not yet existing college campus College of the Canyons Thursday night. The name was selected from a list of ten that had been submitted for the board's consideration. The selection was made with little comment from the board members, but plenty of thunder from the audience, some of whom objected to the lack of a recognizable geographic location in the name. "That's the problem," trustee Edward Muhl replied to one particularly vehement woman protestor [illegible] name." Said board president William Bonelli: "This is a problem all public districts face here, no name. As soon as the valley agrees on one, then I am sure you will see a number of public districts changing their name." College of the Canyons, said student personnel chief Charles Rheinschmidt, was the name best liked by some 40 Hart High School seniors, who have been working with him getting ready for the first year of operation this September. The Canyon name went nicely with the mascot chosen by the students — cougars, he pointed out. Rheinschmidt said next to the Canyon name, the students next best liked Santa Clarita College — the name of the district. The Canyon name, however, did not win such applause from the adult members as it apparently had from the students. "It's nothing, it's nondescript," said one woman. "It should be named Valencia," said Robert Rawhles, former board candidate who stormed out in anger after Dr. Bonelli asked him to wait for the chair to address him before speaking out. Said Bonelli, after everyone was done talking, "Well, children are funny. They look for a name that is euphonious. The desire to name the college after the particular area of the valley they come from is not so strong. The desire to find a name for this valley is less strong in them than it is in the adults." Then, very quickly, the board members, with no further comment, decided to name their campus as the administration had recommended. 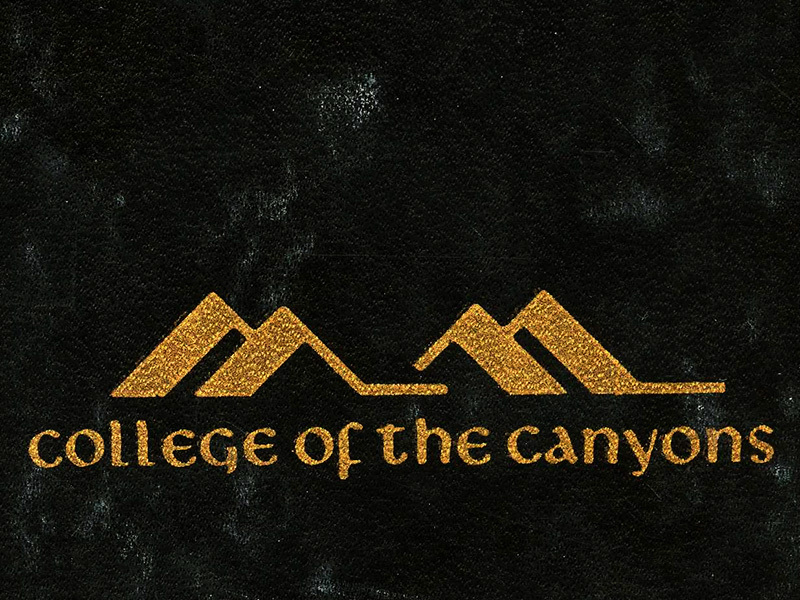 College of the Canyons will be the name of the campus which will open this September in the evenings at the Hart High School. Within a quarter or two, officials are hopeful they win have their College of the Canyons moved to a permanent site.